Tom Brady wasn’t the only quarterback with strong Irish American roots to have a productive, enjoyable Thanksgiving weekend. Matt Ryan, the Atlanta Falcons trigger man comes from an Irish family, his parents Bernice and Michael Ryan are of Irish-Catholic origin. Ryan's uncle, John Loughery, played quarterback at Boston College from 1979-82, while Ryan himself basically ripped up the record books for the Eagles. Ryan was part of one of the most remarkable comebacks in BC football history, leading the Eagles to a 14-10 win at then No. 8 Virginia Tech. Down 10-0 with 4:11 left in the game, Ryan led the Eagles on a nine-play, 92-yard scoring drive in 2:05. Then, after BC recovered an onside kick, he put together a seven-play, 66-yard drive that culminated with a beautiful 32-yard touchdown pass to Andre Callender with 11 seconds remaining in the game. The stats only tell half the story, Ryan weaved in and out of serious VT pressure, keeping several plays alive by the skin of his teeth. He finished the game 25-52 for 285 yards and two touchdowns. On Sunday the Falcons announced themselves as very serious title contenders, with a hard fought, exciting win over Green Bay. The Packer’s Aaron Rodgers was superb, but Matt Ryan was just that little bit better. The Falcons won 20-17. Matt Bryant kicked a 47-yard field goal with 13 seconds left for the win after Ryan drove them down the field with barely a minute left. Michael Turner rushed for 110 yards and a touchdown for Atlanta, while Ryan improved to a very Brady like 19-1 in his career as a starter at home. 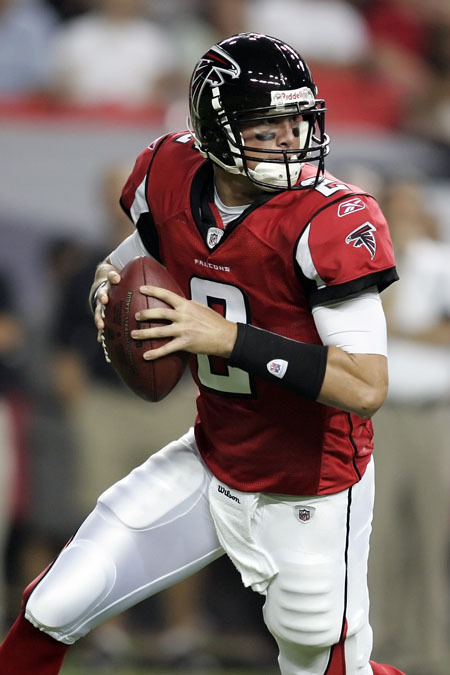 Ryan led the Falcons to their fifth straight win. 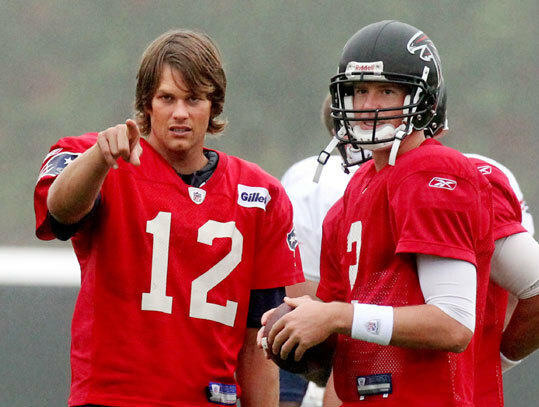 Another thing the two most Irish QBs in the NFL have in common? They are both leading two of the joint most winning teams in football right now, with the Falcons, Patriots and Jets all on 9-2. 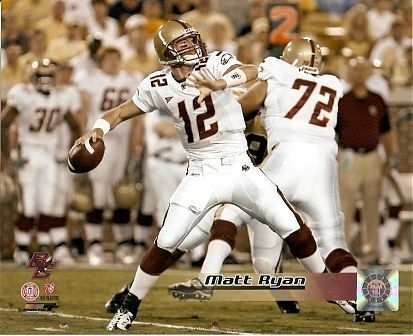 Ryan came out of Boston College as one of those rare, ‘plug and play’ QBs who was instantly ready for NFL play. His first NFL pass went for a 60 yard touchdown. Ryan is off to a fantastic start in his 41 NFL games to date. He has already thrown for 9,000 yards and a whopping 57 touchdowns. If he keeps that pace up, if won’t be just the Boston College record book he will be leaving his name all over. The Falcons and indeed NFL versions will have a healthy slice of ‘Matty Ice’ in their pages too.